UFO SIGHTINGS DAILY: UFO In Earths Orbit Seen From Space Station On Sep 30, 2016, Video, UFO Sighting News. UFO In Earths Orbit Seen From Space Station On Sep 30, 2016, Video, UFO Sighting News. 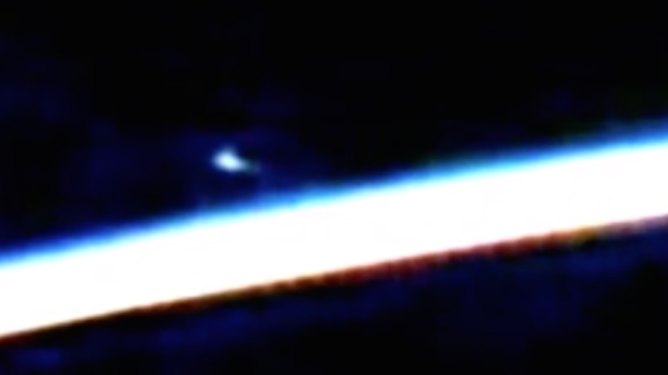 This blue glowing UFO was seen near the space station yesterday by Streetcap1 of Youtube. It appears far away, but its not. Its actually very close to the space station, but higher up so it appears distant. Excellent find by Streetcap1. Unidentified Object is brighter on the left side due to the light from the Sun, so not Lens Flare. NASA cut the camera feed so quickly even though this was very distant, but I still managed to get a couple of frames to enlarge. Streetcap1.